I have to admit, I didn’t even notice these little 2″x2″ treat boxes the first time I went through my catalog. But then I saw that the current Artisan team was using them last month in their Blog Hop and I knew I had to get them on my next order. These fun little boxes are a great size to give someone a little treat without having to buy tons of stuff to fill a big box. They make a nice thank you to someone who did something for you that you wouldn’t normally give a monetary gift too. Think school secretary, the bank teller, your favorite grocery/store clerk, or dental hygienist. Ok, maybe not candy for the dental hygienist. You do want them to know you appreciate them, but it would be a little awkward to give them a present or gift. These tiny treat boxes are perfect for that situation. Cut a 9″x1″ strip of paper from the Pop of Pink Paper Pack and wrap it around the outside of the box. Make sure your seam is on the top side of the box as it will be hidden under the tag. Use our new Tear & Tape adhesive to glue the ends of the paper together. Do not glue it to the box. This is so the recipient can easily slide the paper band off the box. The Cucumber Crush Thick Baker’s Twine is wrapped around the paper band twice and knotted it in the center at the top of the box. Trim the ends so they aren’t too long. 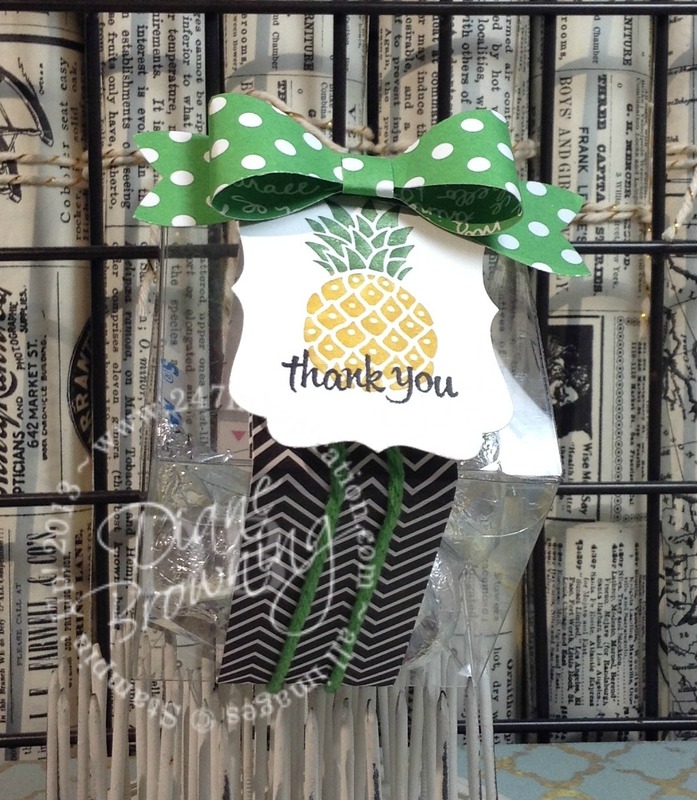 To make the tag, color the pineapple stamp using Crushed Curry and Cucumber Crush markers. Then stamp the “thank you” across the bottom. 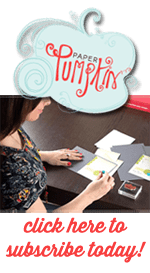 Once both images are stamped, use the Decorative Label punch to punch out the image, centering the pineapple in the middle. To attach the tag to the top of the box, use dimensionals stacked two high an either side of the knot. The adorable little bow is made using the Bow Builder punch and lots of glue dots. I’ve found the best adhesive for these little bows is glue dots. I tried the Fine-Tip Glue Pen too, but it takes too much drying time and I’m not patient enough to sit there long enough holding all the pieces in place while glue dries.